Petite vs Regular - IDS Furniture, Inc.
Well, the answer is really quite simple. The only difference between a "petite side chair" and a "side chair" (aka regular side chair) is the width. We take this measurement across the front rail of the chair or better defined as the nailhead line. 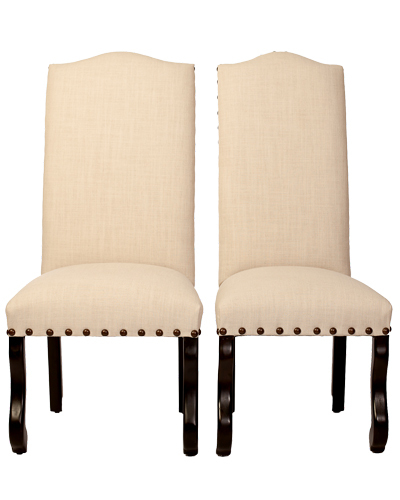 A petite side chair has a front width of 19.5-inches and a (regular) side chair has a front width of 21.5-inches. That's it, it is really that simple. It does not refer to any other dimension on the chair. The back height is irrelevant, and the depth doesn't change. So, what's the big deal - for such a tiny difference? You see, the narrower width of the petite allows you to comfortably fit more chairs around a table, while the regular allows your behind to fit more comfortably on the chair. But honestly, they sit about the same. So really, its personal preference. Order the regular size for the captain's chairs, where you typically have more room at the head of the table. Order petites for the remainder of the table where you need to squeeze in more guests at holidays and larger gatherings. Ordering chairs for a round table?